ive had a similar journal as well. evernote first, then onenote, evernote again for a while. then i started using todoist since neither of the other two had a reminder feature at the time. i thought todoist was the one until workflowy showed up and i liked it so much i moved years worth of stuff from evernote, onenote and todoist to workflowy in the space of two weeks. but after using it for over a year now it is completely chock a block with all sort of everything. i could be working in one part when i think of something i need to add to another part, and it’s really tedious having to zoom out each time and then back to where you were you left off. yea you can bookmark things, but after you’ve made more than 5 bookmarks you then have to side scroll though a horizontal list. dynalist is a dream to work with though. its not as polished as workflowy yet, and it’s a bit buggy at times but at least they are open about their roadmap. you can see they are not going to just milk an unfinished product but are actually working hard to really improve it. The lack of development and response from workflowy developers are frustrating. Dynalist is definitely close to perfect. However, it’s now nearly $100 a year for the Pro. That seems very high compared to, say, Todoist ($50), OneNote (free if you’re in any company that has Office365, or Google Keep (free). Yes, Dynalist is where I want to be, but not for double the cost of Todoist, with less features. So is Dynalist still your goto app a couple of years on? Yes, I use both Dynalist and TiddlyWiki. 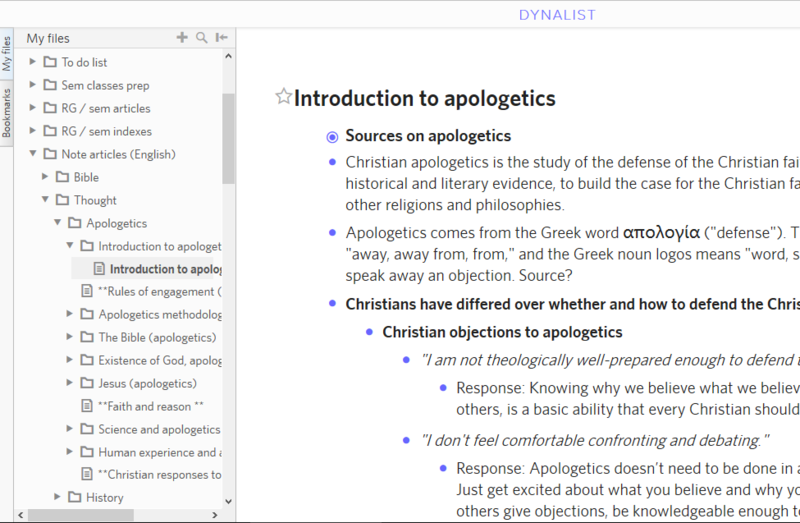 My biggest project (sorry, can’t share it) is to take notes in Dynalist by topic, and use TiddlyWiki as an index with links to the pages. This system is working really well for me. That’s good to hear. I have just signed up because they give charities a 50% discount. Why would you create an Index in Tiddlywiki when you can do this in Dynalist? what purpose does it serve? 1) I just like TiddlyWiki for indexing because I can do automated lists, tagging, extensive styling, etc, but I like Dynalist for fast, outline-style writing. I am using each tool for its strength. 2) Separating the index from the entries, one on each platform, makes searching easier in both, since there are no double search results for each topic. 3) If I share the index file with colleagues, it is easier to navigate for people who are not used to outliners.